An investigation by the Investigative Project on Terrorism finds that known radical Islamists made hundreds of visits to the White House. The organization revealed its findings in a report on its website on Sunday. Court documents and other records have identified many of these visitors as belonging to groups serving as fronts for the Muslim Brotherhood, Hamas and other terrorist organizations, noted IPT. The IPT made the discovery combing through millions of White House visitor log entries. IPT compared the visitors' names with lists of known radical Islamists. Among the visitors were officials representing groups which have been designated by the Department of Justice as unindicted co-conspirators in terrorist trials; terrorist groups including Hamas and Hizbullah; groups that have obstructed terrorist investigations by instructing their followers not to cooperate with law enforcement; promoted the incendiary conspiratorial allegation that the United States is engaged in a "war against Islam"; repeatedly claimed that many of the Islamic terrorists convicted since September 11 were framed by the U.S government as part of an anti-Muslim profiling campaign. Individuals from the Council on American-Islamic Relations (CAIR) visited the White House at least 20 times starting in 2009, IPT discovered. In 2008, CAIR was listed as an unindicted co-conspirator in the largest terrorist money laundering case in U.S. history – the trial of the Holy Land Foundation in which five HLF officials were convicted of funneling money to Hamas. U.S. District Court Judge Jorge Solis has ruled that, "The Government has produced ample evidence to establish the association" of CAIR to Hamas, upholding their designations as unindicted co-conspirators. In 2008, the FBI formally ended all contact with CAIR because of its ties to Hamas. Reliable sources told IPT that Monteiro was White House liaison for secret contacts with CAIR, especially with Ayloush. IPT learned that the White House logs curiously have omitted Ayloush's three meetings with two other senior White House officials. Law enforcement first noticed Safi in 1995 when his voice was captured in an FBI wiretap of now-convicted PA Islamic Jihad leader Sami Al-Arian. At the time of his conversation with Al-Arian, Safi served as executive director of the International Institute of Islamic Thought, an organization listed in law-enforcement and in internal Muslim Brotherhood documents as one of the movement's top front groups in North America. Safi also wrote for the Middle East Affairs Journal, produced by the United Association for Studies and Research (UASR). That group was established by Hamas deputy political leader Mousa Abu Marzook and part of the Hamas-support network called the "Palestine Committee." Safi has repeatedly expressed understanding for the underlying causes that provoke terrorism: "Terrorism cannot be fought by…ignoring its root causes. The first step…is to examine the conditions that give rise to the anger, frustration, and desperation that fuel all terrorist acts." He also called PA Arab terrorists "freedom" fighters. Esam Omeish, former head of the Muslim Brotherhood-created Muslim American Society, visited the White House three times, noted IPT. Last month, noted IPT, Omeish attended a reception for Egyptian President Mohammed Morsi during Morsi's United Nations visit. Omeish posted a picture of the event on his Facebook page and noted, "His Excellency provided great insights and we share important perspectives." Despite the President's public proclamations that he is standing strong against terrorism, the White House logs demonstrate that he has legitimized the very same groups that espouse radical Islamic terrorism. The Muslim Public Affairs Council (MPAC) has secured the closest working relationship with the Obama White House despite a record of anti-Semitism, whitewashing the terrorist threat and hostility toward law enforcement, IPT found. No less than fifteen MPAC officials have been welcomed by the White House, the organization has found. Executive Director Salam al-Marayati enjoyed at least six White House visits between September 2009 and July 2011, mostly involving meetings with Monteiro. Alejandro Beutel, who was MPAC's government liaison until July 2012, had ten White House visits between July 2010 and May 2012. MPAC's Washington director Haris Tarin made 24 trips to the White House between December 2009 and March 2012. Those meetings often were intimate in nature, involving a handful of people at most. Edina Lekovic, an MPAC spokeswoman, visited the White House twice in July 2010. IPT noted that as a UCLA student, Lekovic served as an editor of a Muslim magazine called Al-Talib, which in 1999 ran an editorial calling Osama bin Laden "a great mujahid" and saying when bin Laden is called a terrorist, "we should defend our brother and refer to him as a freedom fighter, someone who has forsaken wealth and power to fight in Allah's cause and speak out against oppressors. We take these stances only to please Allah." That issue identified Lekovic as a managing editor. MPAC defended Hizbullah’s 1983 attack on a U.S. Marine barracks in Lebanon which killed 241 Americans and questioned U.S.-terror designations for Hamas and Islamic Jihad. The White House, noted IPT, turned to MPAC officials as it prepared two papers on combating what it calls violent extremism in America. 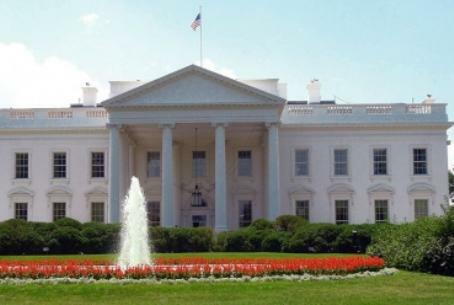 White House logs show Islamists visiting the White House who may have lower profiles, but who also defended terrorists and terrorist groups, and repeatedly castigated law enforcement, especially in counter-terror sting operations, noted IPT.